winter riding means being prepared for a wide range of conditions, right? sub freezing!, 20s & powder, 30s & rain, deep stuff, mushy slush, ice pellets, glare ice, glorious hard pack, sun, clouds, high winds, cross winds, you name it, we face it. NE still hasn't seen a bad winter in my opinion, no blizzards yet & still haven't had a giant dumping requiring roof raking. oops just jinxed us. who knows what the rest of February & dreadful March will bring our way. get your winter cycling in before it's gone! you know you'll miss it! So what do I hate the least about winter riding? Clear, clean, and dry pavement at any temperature and no precipitation. 74 F a couple days ago. Ice, ice and more ice, when the entire landscape is frozen hard as a rock...Seriously the hardest part to ride through is deep snow and deep slush. It's a lot easier to ride over everything when it's frozen solid. That's exactly what we had today in my area. I've been enjoying riding with temps in the 20's and frozen trails. Don't worry rumrunn6 snow will be back before we know it, winter isn't going away that easy. I've been enjoying riding with temps in the 20's and frozen trails.Don't worry rumrunn6 snow will be back before we know it, winter isn't going away that easy. winter riding means being prepared for a wide range of conditions, right? sub freezing!, 20s & powder, 30s & rain, deep stuff, mushy slush, ice pellets, glare ice, glorious hard pack, sun, clouds, high winds, cross winds, you name it, we face it. NE still hasn't seen a bad winter in my opinion, no blizzards yet & still haven't had a giant dumping requiring roof raking. oops just jinxed us. who knows what the rest of February & dreadful March will bring our way. get your winter cycling in before it's gone! you know you'll miss it! My job; either too much to do, so I stay (comfortably) overnight and resume very early in the AM, missing my commute; or have to travel afar for a meeting. I have the opportunity to commute a minimal 14 miles one-way during the week (Commuter Rail home), and round-trip on Saturday all year-round, for about 100 miles a week. During the nice weather, I’d like to put in about 150-200 miles to train and do long rides. You’re cetainly right about this being a friendly winter for riding. 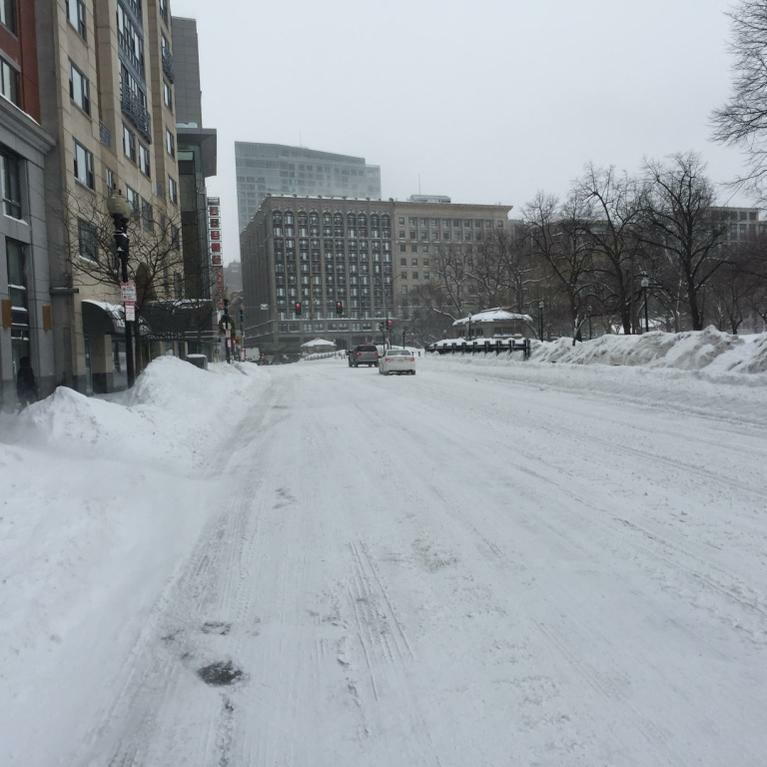 During the single-digit, last week of January, I was (fortunately) stymied by attending a week-long conference in Boston. At such conferences I usually offer to take visitors on an evening walking tour in downtown, but no takers. Always asked with amusement and respect. Last edited by Jim from Boston; 02-09-19 at 08:57 AM. 55 F to 75 F, sunny, dry with a light breeze. I actually like riding in rain/snow as long as it is not real heavy and the wind not more than 15 mph. Not much of a winter to write about here this year, but my favorite conditions to ride in during winter are days with no wind, temps above the single digits, and most importantly a consistent ground cover - icy, powder, or dry are all fine by me, what makes winter riding frustrating are the days when there's patches of ice, but not enough to make the studded tires useful, or the persistent patches of ice and deep wheel-catching ruts that the freeze-thaw cycle produces. Dry pavement, no salt, anything above , say 25F, and slightly overcast with no blinding sun, no wind, and some sporting event such as football or Nascar races or tractor pulls keeping the pick-ups and SUVs off the road. Amen, may it always be so! Today came pretty close to an ideal winter day for riding. Temp was just below freezing, no wind, dry. I'm pretty much acclimated to the cold by now, and I put on a silk layer under all the wool: warm as toast. a silk layer under all the wool: warm as toast. Dry , about 10C that's the best winter high and the summer low around here..
My ideal conditions are 80ºF, sunny, dry, and not too much wind. Oh, you asked about favorite winter conditions? 80ºF is getting a bit warm, 65º is better. Had that last week. Sure, it makes little difference to me, as long as I can wear shorts. I guess my minimum temperature for that is around 55º. I'm really OK in most temperatures, most of the time. Basically, I'm just an insensitive guy. My ideal conditions are 80ºF, sunny, dry, and not too much wind. Oh, you asked about favorite winter conditions? +10 to overcast, especially in the AM, or PM around sunset with the sun directly at about eye level. It seems that sometime in early February though, I start to notice some welcome radiant heat from the sun. So do you track? How do you track? and what do you track? Wind speed and direction: Either as recorded on a weather station, or on a personal 1 to 6 scale (headwind / tailwind) based on flying flags; to explain variations in average speed. My saying about wind chill is, “Wind chill is for wimps.” There always will be a wind chill when you cycle, and in the summer it can be beneficial. So I dress for the actual temperature rather than "feels like..."
@Jim from Boston , where do you get wind speed and direction? I haven't found an accurate web site. Maybe it's hard to do here, as the wind speed and direction varies from one spot to another because of how the terrain shapes the wind. There are some spots that normally have wind in reverse direction at almost all times, so I'm observing eddies. I really enjoy towards the end of the season where there is some melting during the day and all the slush turns to ice as the sun goes down. Riding around with my studded fat bike tires making loud crunching noises. Early morning the deflating snow drifts have set up hard enough overnight to ride on top of. Generally during the winter I'm just happy if the wind is light, which is a rarity.